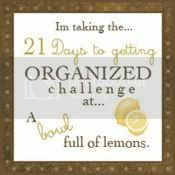 Well yesterday, I decided to take the 21 Day Organizing Challenge over at A bowl full of lemons. Since yesterday was technically Day 1 of the challenge, I jumped right in and tackled my junk drawers and my countertop which I hate to admit is more of a junk drawer than a workspace! My dad refinished the great dry sink above a couple of years ago. It was languishing in my grandparent's shed when Dad found it. Now it looks great in my kitchen...when it's not covered in STUFF. Unfortunately that's not often! The drawers aren't much better. I keep my kitchen towels in one of them but the other two are my official junk drawers. Here's a shot of my kitchen counter. Now, I just did a quick sweep of the counter a couple of weeks ago so it wasn't as bad as it has been in the past. But it's amazing how quickly it can get cluttered again. As I was cleaning out my junk drawers, I found that I had put several of the pieces I brought home from my grandparent's home months ago when my grandma passed away. It's not that I don't value these pieces but I think I just didn't want to deal with them at the time. I LOVE the blue knit purse in the back. We think Grandma or one of her friends made it. My boss even borrowed it to look at the pattern! The box in the middle is one I brought back for her from my semester abroad in Poland during college. It still has two decks of cards of hers in it. She and my grandpa LOVED to play cards. She was still an awesome Euchre player in her late 80s. and chapstick, pens, bandaids and sunglasses. It's a bit scary! Notice the full trash can...in addition to organizing I even managed to get rid of some stuff! It feels great to mark off one task of the Challenge! I don't really have a computer desk so I need to decide what to tackle in its place. I soo need to do this. Love your before after pics... I think half of my problem is that I can't visualize how nice everything is going to look once I declutter/organize... I am always surprised... silly as that sounds. Wow! I think your "counter" should have counted as the computer desk. I did the junk drawer this morning, which led to doing the top of the fridge, too. My mom's coming to help me in the office so we'll do computer desk today, too. So I'm doing day 1 and 2 today, I guess. I'm planning to post about it once a week.